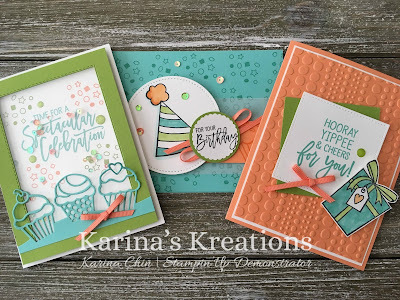 Karina's Kreations: Stampin'Up Birthday Cheer Card Kit on the Mail Class! 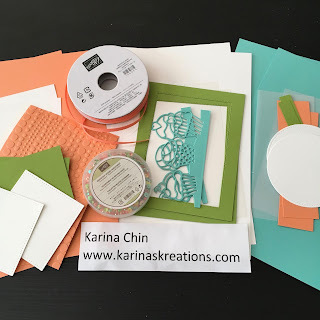 Stampin'Up Birthday Cheer Card Kit on the Mail Class! Have a relaxing time stamping when you purchase a Card Kit in the Mail Class from me. The Birthday Cheer class includes 3 card kit designs and the pieces to make 2 of each card. I also include some embellishments, PDF instructions and a video so you can stamp along with me. FREE Level 1 Sale-a-bration item. 3) PDF Instructions Only $15.00. Please click this link to email me to order your kit or PDF! Once you email me, I will send you a paypal invoice. Extra supplies needed for this class are a Memento Black ink pad, Granny Apple Green, Grapefruit Groce and Costal Cabana Ink pads, Light Granny Apple Green,Light Bermuda Bay and Light Pumpkin Pie Stampin Blends. Contact me to add these onto your order.